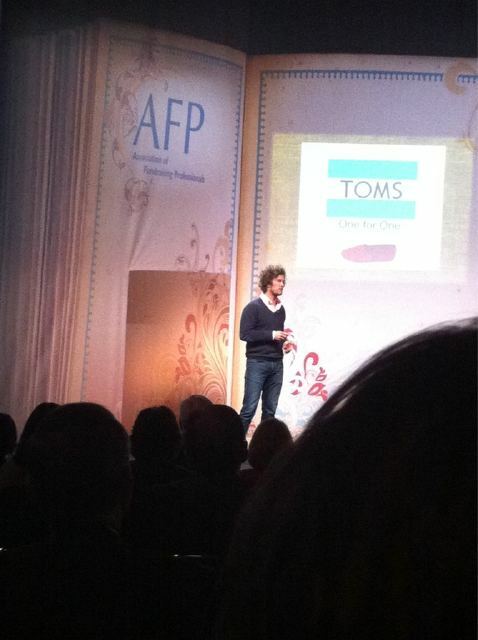 Blake Mycoskie, Chief Shoe Giver of TOMS shoes, just spoke at AFP International Conference in Chicago. Here’s a wrap-up! Blake was on the Amazing Race 9 years ago and after spending long days in the business world developing online drivers’ education software (what?) he decided to take a short siesta and went to Argentina to drink wine and hang out in cafes. He met women doing a ‘shoe drive’ – who were collecting gently used shoes in Buenos Aires and delivering them to kids who needed shoes to go to school (as required by their uniform policy). He asked to join them, they agreed and he was dramatically touched by the smiles and excitement of the children. It was a foreign feeling. Putting shoes on kids feet and feeling so incredible about it. The question arose, what happened when the kids needed their next pair? Kids outgrow shoes so fast – did he really DO good – or just feel that way? He was writing & journaling and wanted to provide his for-profit skills with an effort to serve the need he saw. He called his partners in LA and pitched the concept. He stayed a couple weeks, made the local shoes and took some back to LA. He brought 6 ‘girlfriends’ together to try the shoes and get their reaction (without sharing the mission). The response was good. THEN he shared the store of the village and the concept of TOMS. They lit up, were the first 6 customers, promised to tell their friends, told him which stores to sell in and how to do it. TOMS was born. But it didn’t work. Company after company turned him down. Until one store agreed and bought 80 pair on the spot. They put a photo of Blake with a child in the window with the “One for One” message. A fashion designer saw it and wanted to put it in her column. It didn’t make it in her column. It made it on the front page. By 2pm that day they had sold 2200 pairs on their website. Great right? Wrong. Blake only had 140 pairs in his apartment. Didn’t know what to do – so he asked for interns. Their job was to call the 2200 and tell them to sit tight while Blake went back to Argentina to make the shoes that were already promised. Production increased. Forward to July 2006. The Devil Wears Prada opens in theaters and Blake got a call from Vogue – who featured Blake which launched pure chaos. Then came Nordstrom and their biggest customer – who was angry he couldn’t produce them fast enough and an intern sealed the deal. That summer they sold 10,000 pairs and it was time for the fun part – to give 10,000 away. Starting the company and all the success didn’t change his life. Giving away the first pair of shoes did. Blake was taken most by a mother who shared that her three sons would share the pair of shoes and rotate using them. It was a signal that he had to do it full time and replicate it several times over. Recently TOMS gave away it’s one millionth pair of shoes. If you incorporate giving into your business, your customers become your best marketers. They become engaged, keep up with the company and truly support the effort. It’s about the story and engaging people to share it. When you incorporate giving into your company, you attract AMAZING employees. Not all companies can do ‘one for one’ or even give much away. But ALL can give their employees time to serve. Cost nothing but time, they forget the stress of work, develop as a team and do better for the company and it’s giving effort. When you engage giving, you attract amazing partners. Partners make it happen. Collaborations work and they’ll expand your reach and impact beyond measure. Ralph Lauren, AT&T and others jumped on board and made great things happen. Which led to more business, more shoe giveaways and more of a difference made. Thanks Blake. Thanks TOMS. And thanks AFP. Want to help? Join the ONE DAY WITHOUT SHOES. Blake truly was inspiring! And you didn’t even share the story of the little girl in the airport…or Blake’s mom cleaning kids’ feet before giving them shoes. I was blown away and am now more passionate than every about the world of philanthropy.